Today I am wearing one of my favorite honeysuckle fragrances, Le Chèvrefeuille by Annick Goutal. Le Chèvrefeuille was released in 2002, and was the third in a series of limited edition soliflores, after Le Muguet and La Violette. It was created by Isabelle Doyen and Camille Goutal, and features honeysuckle, green notes, narcissus, jasmine, lemon petitgrain. Le Chèvrefeuille opens with sharp citrus notes, and settles into a very green honeysuckle. 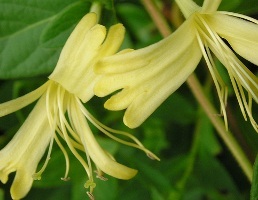 There are hints of narcissus and jasmine, but the honeysuckle stays in the forefront. Honeysuckle is so often overwhelming in perfume, as though the flower had been placed on steroids, but the Annick Goutal is bright, sparkling, and summery, and not at all cloying. It is an Eau de Toilette and the lasting power is poor, maybe a few hours at most; still, it is so perfect a rendition of honeysuckle that it is worth every penny. If you love green notes, Eau de Camille is another Annick Goutal honeysuckle worth trying. It is much greener and grassier, and lasts just a bit longer, but I prefer the brightness of Le Chèvrefeuille. Although this was a limited edition, it is still listed on the Annick Goutal website. It can be found at online perfume discounters in the United States and at some Nordstrom stores. La Violette, by the way, was recently reissued, again in limited edition. Note: top image is wild honeysuckle vine by Buttersweet at flickr; some rights reserved. Hello R! I like this a lot but Calypso Chevrefeuille is fantastic too – I received it as a gift from a friend last summer – I used up a lot of that huge bottle. Guess on very warm days when you do not feel like a dark perfume – this is perfect. My long time favourites from AG are Eau de Ciel and Eau d'Hadrien. N, I like the AG a little better than the Calypso, but they are both lovely. And I like Eau de Sud a little better than Hadrien, although everyone thinks it is a bit more masculine. Oh well! Hi NST, I smelled this with Neela at some point, I guess last summer–and I really liked it, but dagnabbit, it (like all AGs) ends up icky on me. The new AG Mandragore is pretty nice, though. Not A Buy, I don't think, however. PS Guess who the aforementioned parislondres' friend is ;D.
Hey, BTW. are you walking around normally now? Oh this is so good to know… it seems like once a week someone is asking for a great honeysuckle scent, so this will be a very nice rec. to pass along. This AG is actually one of the few that works for me. And it is perfect for spring! Thanks for your lovely review, R.
Thanks for reviewing an AG scent. I love these fragrances, and only recently tried Chevrefueille. It's a very nice springy scent! My other favorites are Eau de Ciel, Folavril, & Petit Cherie. I also adore Hadrien, but unfortunately it only lasts minutes on my skin before it disappears. Eau du Sud is fantastic as well – a richer more herbal citrus scent. On impulse I recently bought La Violette – mainly because it is ltd. edition. Very unusual interpretation of violet – an acquired taste I think: it smells more strongly of crushed twigs & stems with a hint of violet wafting through. Wasn't sure if I liked it at first, but it is growing on me. I would love to hear more comments on AG perfumes! Not everyone's cup of tea, but definitely unique. me too! i have always loved annick goutal. one of my favorites is also folavril, but being a lily lover i try to get des lys whenever i can. ag reissued it in a limited edition. casablanca lilies abound!! as for hadrien, it always seems to me that the soap has more staying power. i got a tiny one as a bonus once and that little gorgeous thing lasted and lasted (and not just the cypress). i could smell it on my skin until the next shower. ever try that? i know there is also a body creme but i haven't tried it so i don't know how long it lasts. petit cherie is a bit sweet for me, i think charlotte is lovely though. Chevrefeuille is really a standout of the the AG line for me…it's wonderful. Most honeysuckle scents I've tried have gone sour or metallic on me, but AG's gentle, sunny version never does. Although I'm concerned about her fragrances turning quickly, I'm such a fan of so many, particularly Eau du Ciel & Ce Soir ou Jamais. Thanks for commenting, I was very curious about the La Violette, which I haven't tried. I generally like crushed twigs & stems so will have to look for it. I have not tried the soap, it sounds lovely! Eau de Sud lasts a bit longer than the Hadrien, but it doesn't have the cypress and I think it is not as popular. Another really nice citrus-cypress is GFT by Geo F Trumper, and it lasts longer than the Hadrien. Notes: mandarin, bergamot and lemon, tarragon, lavender, cypress, musk-like base with notes of cedar and moss. The only AGs I own are Chevrefeuille & Eau de Sud, and I have had both for quite some time with no problems. There were quite a few comments under the review of Mandragore about short shelf life though! Oops, that wasn't clear: the comments were about short shelf life of various AGs, but not Mandragore! Ah, that's good to hear! There have been so many complaints about AG fragrances turning on the boards, that I avoided the whole line for awhile. But I think most of those complaints were about Petite Cherie (which indeed smells “off” in every tester I've tried thus far). I love this fragrance! This is one of my summer fragrances and I always get compliments. Petite Cherie was the first Annick Goutal I purchased at the Paris Boutique before it was available in the states. It is such a different experience from buying fragrance in the states. It was how fragrance was meant to be sold…a small little boutique, with a lovely French woman. Would love to visit the Paris boutique, which I hear is beyond charming. Wish they'd open one here! Hi Sharon! It could well have lily of the valley, I'd say — I didn't smell it but that doesn't mean anything at all. And thank you so much for the very kind words! I have recently gotten into AG perfumes – I now have Gardenia Passion, Songes, Petite Cherie, Tubereuse, Neroli, Le Jasmin and today Le Chevrefeuil! I was at the “France” area of Epcot in Disneyworld in the perfume shop, and they had a wonderful sheet of info from AG about combining her perfumes. Does anyone know where i could get this info? PS- thanks for this website – I just love it! I remember that store! No, sorry, I've never seen a list of recommended layering fragrances from AG, and come to think of it, there aren't all that many in the line I'd be tempted to layer. But the soliflores, like Chevrefeuille, might layer nicely. And thanks for the nice words! The only one I remember on the list was to combine Vanille Esquise and Petite Cherie. I have the Petite Cherie and a decant of the Vanille, so I tried it. It's actually kind of nice, but a little too sweet for my taste. Vanille Exquise might layer nicely w/ several of the others, and would also think Hadrien would work well. I was at the AG counter today and she layered Neroli and Gardenia, which was nice. I frequently layer neroli and jasmine oils I have and it is one of my fave combos – you have both of those in the AG so you might try that. Sharon – I pick up a very subtle lily of the valley as well. Normally I don't care for it much, as it tends to be overpowering, but it is so understated here that it works quite well. If I could get anything like your lasting power, this one would definitely be FB-worthy. R, I absolutely adore this but it just would not last. About 4 hrs ago sprayed Tea for Two on one hand and this on the other. Now Tea for Two is still as strong as ever but Le Chevrefeuille is gone! Can you recommend any other honeysuckle like this with great longevity? No, it will not last, but I don't think you'll find a lovelier honeysuckle…those that last tend to be brasher, less ethereal. But you could try Jo Malone Honeysuckle & Jasmine, maybe. Or Diptyque Olene, although that one's more mixed. Jo Malones dont last well either but I still like their fragrances. I heard Olene is a heady floral which is why I've been put off smelling it but I'll try them both soon. Just a shame Le Chevrefeuille doesnt last, it is too pretty.. I think it is virtually impossible to make something this ethereal last. When you get lasting power with something so light and citrusy, you lose something else & generally end up too brash. So, I forgive Chevrefeuille & just don't worry about the lasting power.